Businesses today have plenty of options to choose from for managing projects. And the makers of smartQ, a workflow management tool, understand that there’s no one-size-fits-all solution; each company has to find the best methods for managing their specific needs. Can you tell us about smartQ? 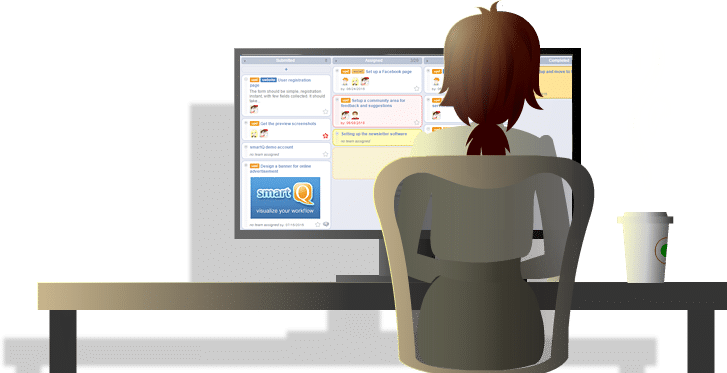 smartQ is a workflow management tool built around a simple whiteboard view called Kanban. It allows people to visualize their tasks on a virtual whiteboard and move them around between stages of a workflow. Instead of changing a task status, you simply drag it to another stage. This makes it easy to visualize and manage a workflow. smartQ works best with repetitive tasks that go through the same pipeline. What sets smartQ apart from other project management software? Kanban is not new. It fits Agile methodology well, so many developer tools integrated it. But smartQ was built to be customized for any industry and workflow. Its customization is the main power of smartQ. How does it work? How can clients customize smartQ to fit their unique needs? You can easily customize smartQ for any workflow. You can customize the stages a ticket goes through and who can move tickets to what stages. It even allows you to define custom fields for your tickets. smartQ also supports creation of tickets from an external form (which can be placed on your website) or email by people not even registered in your smartQ account. This makes it possible to use it for a Help Desk as well. With multiple projects inside one smartQ account ,you can have different workflows going on. HR could use it to handle the interview process, accounting to handle the invoices, IT to handle the support tickets, and customer support to handle requests from external customers. What are the biggest frustrations your clients come to you with in regard to project management? Tools out there are either too complex or too simple. Adoption is the biggest issue. While a manager may want a tool with all kinds of reports and analytics, a worker that uses it daily just wants something simple that requires no training. Otherwise, everybody is back to email, Excel files and sticky notes. How do you help them overcome these problems? With smartQ, we try to keep it simple on the surface while packing a lot of features “under the hood.” Striking this balance can be difficult, though. We have to listen to our clients constantly and adjust. Why is software like yours so important to the success of a business today? What are the risks of not managing workflow digitally? Going digital is about staying flexible. People work from different locations, across time zones and in different languages. Our own team is spread all over the world. smartQ is available in 10 languages right now, and we just released the iPad app for it (to complement the iPhone app). How is the way businesses manage projects evolving? Businesses move online and incorporate a distributed workplace. There is a tendency to integrate existing tools instead of looking for a huge solution that tries to do it all. Being open in this environment is important. This is why a majority of the tools offer an open API, including smartQ. Third party vendors, or our clients, can use it to built connections to their other tools or create their own data views – custom reports, alerts, etc. What are some of your other favorite tools for helping business owners manage people, projects and clients? Well, we use our own tools. We use 5pm daily as well for more traditional project management; we use SpiderScribe.net for brainstorming, Firefly to discuss designs and 8am for a group calendar and client notes. We also use Google Docs for shared documents, GoToMeeting for video conferences, and Skype for group chat. Connect with smartQ on Facebook, Twitter and Google+. Watch a demo to learn more about how PerfectForms can help your business. This entry was posted on Friday, May 15th, 2015 at 12:24 am	and is filed under Workflow. You can follow any responses to this entry through the RSS 2.0 feed.